When 2+2 Doesn't Equal 4! Chances are that in the coming holiday season you will be looking to double a recipe or two. During the holidays we tend to gather big and eat big and whether or not we intend it we generally have an abundance to eat and share this time of year. As you embark on sharing those old classic, or new favorite recipes with your loved ones this season there are a few things to keep in mind to get the best result. It seems easy enough. When you double a recipe you just double everything in it, right? Well, not exactly. As we learned in English class years and years ago: There is an exception to every rule! These simple guidelines will help you get the best of your recipes even when you are switching to crowd-pleasing size. Spice and Heat: A little heat is nice, but a 5-alarm fire in your mouth isn't and spicy ingredients can go a long way. Spicy ingredients like chiles and cayenne pepper rarely need to be doubled. Though you may be doubling the recipe try starting slow by adding 1 1/4 of what the original recipe calls for. If that isn't spicy enough you can always step it up to 1 1/2 or more if you want, but remember that you can always increase the heat, but it is very hard to fix a dish that is too spicy for your crowd! Butter for Sauteing: When searing or sauteing, use only the amount of oil or butter it takes to cover your pan's surface. Don't double the butter just for the sake of doubling the original number. You really just need the surface of the pan coated and anything more is just adding fat. Herbs and Spices: These flavors go a long way and can really overpower and ruin a dish if they are over used. Similar to the spicy foods, you want to start slow by using 1 1/2 times the original when you are dealing with dried herbs, spices, and salt. Again, you can always add more, but you can't take it away. 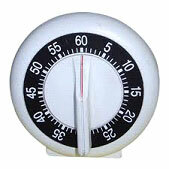 Cook Times: Especially when baking, remember that cook times should not be doubled. It will take longer to bake than the original recipe, but probably not twice as long. Check the dish at the time on the original recipe, though you can expect that it probably won't be done. Then check back every few minutes (depending on what you are cooking) to check again. A little bonus trick for you - don't leave the door open while you check food. Take the pan out and do your checking with the oven door closed. This way you won't lose so much of the heat you have been building up in the oven. Make Note: One of the best suggestions I can make is that you save whatever changes you made! Right them down, or save them in Cook'n, but keep track of them so that the next time you go to make that recipe (because everybody loved it so much the first time) you don't have to start the guessing game over. Keep track of what amounts you used and what feedback you had. Maybe next time it could use a little more heat, or a little less salt. Whatever the case, you want to know the next time you go to double that recipe which adjustments made it just right! I hope this new holiday season holds many plentiful feasts, hearty laughs, and lots of love for each of you!